Mix together the flour, salt, pepper, oil and egg yolks. Gradually whisk in the beer. Refrigerate the batter 3 to 4 hours before using. Slice onions into rings; separate rings and dip in the batter. Deep-fry in batches in 370° oil until golden brown. 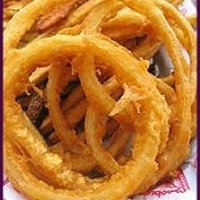 wonderful as usual, I will have a burger and an order of these onion rings please! But, when you put alcohol into food, most of it cooks out. With beer, it's so low in alcohol anyway, that it really shouldn't matter. This sounds good. Maybe I could use Sharps for this and it be okay. Come on, Lana --- pass some over and we'll compare recipes!!! LOL!!!!! I can't wait to try these! Yum!!! But, if you live near Washington state, in the late summer and fall, Walla Walla Sweets should be obvious! Wow, Lana! My kids are in for a treat this weekend! My sons keep peeking over my shoulder to see what kind of recipes there are here and they just spotted the burgers and rings. These look just like the ones my dad used to pick up for me at a little restaurant where I grew up. Big 5 from me!